Theme is probably the hardest thing to handle when it comes to making movies. Hit it too hard and you have an after-school special (“Yes, teacher, I’ve learned now that bullying is wrong!”). Hit it too lightly and you have a hot mess (Clerks). In a mindless movie, especially an action movie or thriller, you have one of two choices for theme: good must triumph and/or we’ve got to get out of here. When it’s handled well, theme is not about what happens but about why what happens matters. Unknown isn’t the best thriller ever made, but it’s better than most that have come along in recent times, including Taken, its near-relation. Better because of the usual things, yes, including three car chases (one vertical). But mostly it’s better because of its theme. First, it’s shocking that it has one at all. Second, it’s not hit too hard. And third, it makes you think, in this case about the old nature-nurture question. I don’t want to give away too much of the plot, but the question is whether a person is born cold-hearted or becomes cold-hearted over time and under the influence of circumstances. Are some people born bad, or does badness blindside them? By the way, did you know Berlin is blue? At least that’s how they’ve filmed it, either with camera filters or a little post-production magic. It occurs to me that one way you know what kind of thriller you’re watching is by the color of the filter: blue for international and/or political thrillers (Unknown, The American, The International, The Ghost Writer, etc.) and green for supernatural thrillers (The Matrix, Paranormal Activity, The Ring, etc.). Dr. Martin Harris (Liam Neeson) has a problem, the least of which is the car accident that nearly takes his life. On awakening from a four-day coma, it turns out that no one—not even his wife, played by January Jones—acknowledges his identity. Is he the person he claims to be? And if not, who is he? And maybe more importantly, why is he? A good thriller is a story within a story. There’s what we see, the story unfolding before us on the screen. And there’s the unseen story, the story behind the story, what we try to figure out as we watch, what will be revealed in time (and hopefully not by the villain explaining everything during a torture scene). What you get when you cast Liam Neeson in movie is what you get when you cast Robert Duvall, Gene Hackman, Meryl Streep, or Helen Mirren—a solid, believable center. The look of pained confusion on Neeson’s face carries Unknown perhaps farther than it might have gone with another actor in the role. January Jones is beautiful but distant in a Grace Kelly, Tippi Hedren kind of way. At first I thought this was a problem, that Jones didn’t have the chops for the role. But by the end, I thought it was the right acting choice. Movies—at least Hollywood movies—go for simple motivations. It’s hard to play ambiguity, but that just what Jones does, and for the most part, she pulls it off. Bruno Ganz brings so much gravitas to the role of an ex-Stasi agent that it’s disappointing not to see more of him, though he isn’t necessary for the plot to work. Most of the story’s moves are telegraphed ahead of time, but the way they’re worked out is compelling. One of the pleasures of this kind of movie is watching as important puzzle pieces are laid out, the unseen story slowly taking shape. But the moviemakers can’t resist speeding things up and making things obvious by adding a scene where the villain explains every aspect of his nefarious plan to the hero he’s about to kill. 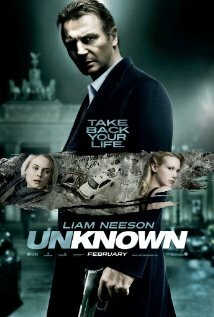 What makes Unknown a cut above the run-of-the-mill thriller are the performances (especially Liam Neeson’s and Bruno Ganz’s), the action sequences (which are shot with just enough imagination to make them interesting), and the theme, which asks how you become what you become, and who are you when it counts? 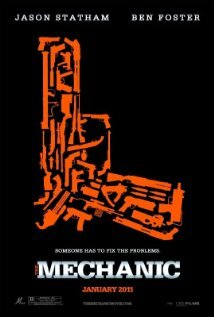 When you watch a movie like The Mechanic, it’s as if the characters themselves haven’t seen a movie since 1964, when, for ten minutes, it was a surprise to find that a politician or a higher-up in law enforcement turned out to be the villain. Who doesn’t know that, in movie-land, the people you trust most will turn out to be the bad guys? Who doesn’t know that the young apprentice to the hit man will eventually turn on him? Have I spoiled the movie for you? Really? The trailer itself gives these plot points away. It may be that the material was fresher in its first incarnation as the Charles Bronson movie of the same name in 1972. Jason Stathan wields his grizzled snarl. And Ben Foster continues to play the kind of guy your mom warned you about (“Do you have to hang out with that Bennie? There’s something not right about that boy.”). And Donald Sutherland does a nice turn as the wheelchair-bound mentor to the assassin. Another sad example of the best actor in the room getting the smallest part, mostly as the exposition mule. That may not be entirely fair. Foster showed his chops in The Messenger. And Stathan may be more than the high-kicking killing machine he always plays. There just isn’t that much meat on this bone for these boys to gnaw on. Stathan and Foster each plays his part at a continuously high pitch of intensity—all crescendo and no diminuendo. Their performances are so boxed in by the simple-minded story that they aren’t allowed to play the full range of human emotion. You take the jobs you’re offered, I guess. Simple-minded how? Our killers shoot up and blow up half the city, including our hero’s house on the bayou (the true star of the movie), but they never worry about leaving fingerprints, DNA, or witnesses. But that’s OK. This is a movie where evidence, witnesses, cops, and, for that matter, the laws of physics and probability would only slow the story down. The writing is serviceable but lacks the leanness of the original, by Lewis John Carlino. Compare a revealing moment from Steve, the young assassin-in-training, from each movie. During one of the rare quiet moments in the new movie, he tells Arthur, his mentor, “I’ve always had this anger inside me.” It’s the definition of on-the-nose dialogue, the thing screenwriters try to avoid because it addresses an issue too directly. In the original movie, albeit in a different scene, Steve says, “My friends are so happy they’re killing themselves.” It’s a much more interesting revelation of character as well as being a funny paradox. One bit of bad writing in the new movie jumps right off the screen. A character tells our hero, “I’m going to put a price on you that’s so high when you look in the mirror, your reflection will want to shoot you.” Kind of funny. The only problem is the character’s supposed to be trying to intimidate our hero, not make him laugh. Fortunately for him, Jason Stathan never laughs. It’s prohibited by his contract. At most he’s allowed a sardonic crinkle. The title must refer to the director, Simon West, who proves that he can deliver a movie with all the originality of a photocopy. The direction is serviceable, but in service to what? Look, I like a good action-thriller as much as the next guy, but The Mechanic just makes you want to watch better examples of the breed—The Professional, Three Days of the Condor, Marathon Man, Le Femme Nikita—movies that don’t let the narrow limits of the form keep them from surprising you. All the loud, bright explosions of half-hearted efforts like The Mechanic are meant to hide the fact that there are no true surprises here, and that the only real victims of assassination are character, plot, and a few hundred billion brain cells.